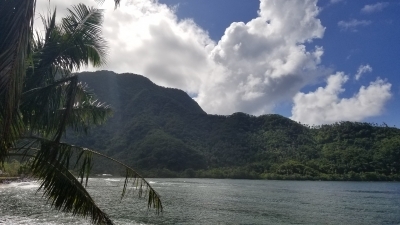 Fagaloa Bay - Uafato Tiavea Conservation Zone is part of the Tentative list of Samoa in order to qualify for inclusion in the World Heritage List. I drove right over the mountain to Uafato, a crazy drive alone but luckily only 10 minutes tops (not that you can't drive the flat northern cape "road" unless you have a 4WD and even then I don't recommend it). I think I wasn't really supposed to though as the villages and beaches in Samoa are private and people looked at me oddly. Nevertheless I made it to the end of the road and one thing is for sure, the views of Fagaloa Bay are great. How about all the stuff they consider world heritage status? I don't buy the cultural aspect. I mean, sure, they still follow the traditional ways, but a chief system is very intangible. The houses are now "modern" for Samoan style. The entire village was playing cricket and I saw nothing of the sorts of cultural heritage. Even if there is it's so hidden for us because there is no tourism for that kind of thing at the moment. Perhaps one can try to find a home-stay and learn more about it. Beauty should never be a criteria for a world heritage site. It's what tourists like me look out for. The forest does reach from the mountain to the shore and it does look great, but I don't find that unique. I also didn't see any wildlife so I can't say for sure what I could see. When I asked about the conservation zone they didn't really know what I was talking about. People in Samoa are often not very interested to what is happening at the other side of the hill. Someone else told me it's a no-go zone, not surprised there. I suspect one could try to enter it from the east side and drive right through but I wasn't going to go all the way back south-east based on a hunch. So is this place worthy of an inscription? Big no. Is it worth seeing? Yes, if you have a car and the time you should try to drive here but if you don't then I wouldn't think you missed one of the places in the world or anything. You are in fact better off going snorkeling at the west coast islands or something.